Change is hard. Anyone who tells you otherwise is selling something. 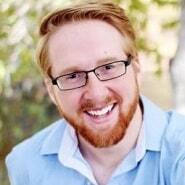 In particular, change across an industry can seem insurmountable. For example, healthcare currently sits in a quagmire of transition; a whole mess of difficult-to-solve problems that make it seem like transformation is nearly impossible. The change, of course, is going from paper to digital and from fee-for-service to true value-based care. Value-based care is the poster child of “easier said than done.” Take for example the drive to share patient data between facilities, an essential component of the shift in care models. I spent several years working in disability law, and our biggest challenge when helping people apply for Social Security benefits was chasing down medical records from dozens of different sources. Applicants were routinely denied, largely because of the lack of interoperability in healthcare. Today, I’m sitting in a conference room watching government representatives, healthcare providers, software vendors and KLAS employees pour their collective focus into the discussion of interoperable data. This Cornerstone Summit comes as a follow-up to a very similar event last year. The difference? KLAS has spent the last year measuring interoperability, and we’ve learned a few things. First, it seems like healthcare providers are moving the needle. While our data is still early (with a report to be published sometime in the coming months), we can see a 2 percent increase in “deep interoperability” across those we interviewed. Deep interoperability means that providers have electronic access to the data, and that data can be easily located, pulled into their workflow, and can actually impact care. This 2 percent change feels small, but we’re hopeful that it’s the first wave indicating that the tide is coming in for data exchange. As I said, change is hard, and in terms of healthcare, we’ve already made some gigantic shifts in the way care is provided. EMR adoption is now the norm, not the exception, and now that we have these new tools, it’s tempting to look at their future potential and want it right now. However, we must face the reality of the long road to reaching that potential. 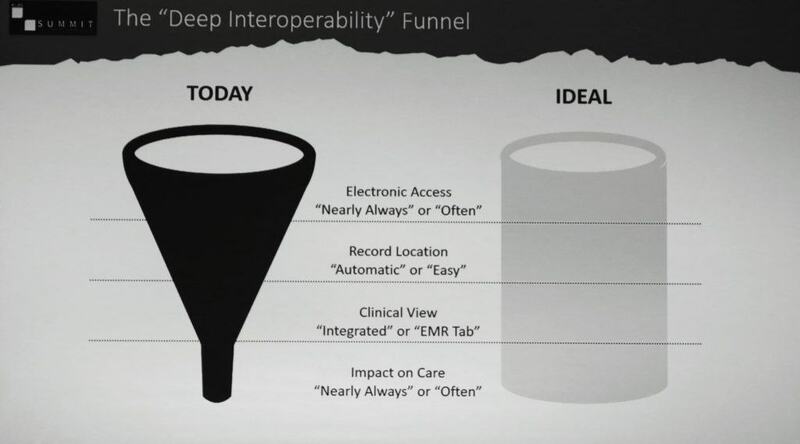 As it stands right now, interoperability in the USA looks more like a funnel, and less like a pipe — though we’re confident it’s not a pipe dream! Bruno Nardone, a senior VP at NextGen Healthcare, made the analogy that it took 70 years between the invention of the automobile in 1886 and the installation of Eisenhower’s interstates in 1956. That first vehicle, while an incredible advancement, couldn’t reach its full potential until the infrastructure around it changed. I’d say that the EMR is currently in the “Ford Model T” phase. We’ve had innovators streamline the process of creating, installing and using the EMR. It’s not perfect, but it’s widely available and it makes sense to switch from paper to digital. Still, we’re a long way from patient data flowing as freely as the freeway. It hasn’t slipped my mind that the interstate came about via heavy government influence. While many may balk at the government in healthcare, the reality is that there remain great opportunities for the right kind of legislation to aid advancing healthcare goals. It was particularly enlightening to sit through the ONC’s pre-conference panel the night before the Cornerstone Summit and watch as they engaged with both providers and vendors on how the 21st Century Cures Act should be rolled out. Those are the crucial conversations that will drive effective regulations, ones that will aid instead of stifle advancement. Hopefully, as we publish the white paper on interoperability, which is the Cornerstone Summit’s ultimate goal, KLAS can continue to measure, make sense of and benchmark the successful exchange of patient data nationwide. While progress to-date has been slow, I’m confident that progress will grow exponentially. Ultimately, as I sit here writing this before the Summit breaks for lunch, I can’t help but imagine these CEOs, CIOs, VPs and executives in reflective yellow vests and hard hats. Simply put, they are the road-builders for tomorrow’s healthcare.